Day 2. Location Almeria. Tomato Tuesday! 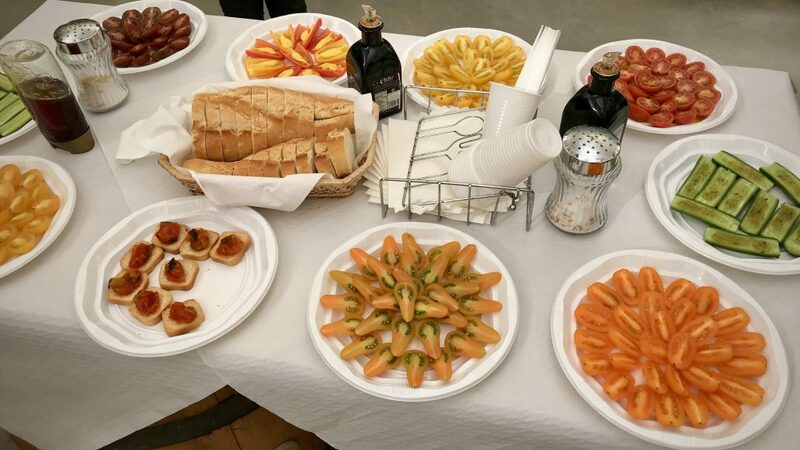 Our visit is to Clisol, based in El Ejido, a family-run tomato and pepper grower. 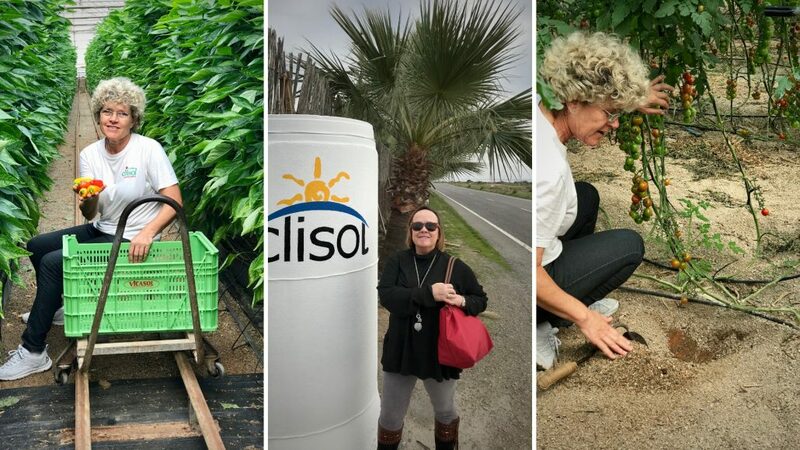 We are met by Clisol’s Lola Gomez, 2nd generation grower who has transformed her family business by creating a finely tuned ecosystem in her greenhouses. Production in greenhouses began some 50 years ago in order to grow produce in the barren terrain. First, they had to bring in the soil to cover the desert. Then they topped the soil with coarse sand to stop evaporation. Then when farmers started using plastic sheets to stop the wind uprooting their plants, they realised that the plastic encouraged plants to ripen faster and in fact that 2 annual crops could be achieved. Thus was born the greenhouse system in Almeria. Lola, a leading lady in her industry, has been a pioneer of organic ecosystems within the greenhouses. What impressed me most was how she introduces a collection of different bugs to cultivate this live ecosystem that’s organic and an ideal environment for growing tomatoes and peppers. Her vegetables grow mostly in containers filled with a shallow layer of coconut ‘soil’. They are fed mineral nutrient solutions via a spray system. Pickers work from sitting on trollies as per the pic above. Lola demonstrated how she ‘combs’ the baby plants twice a day to strengthen them, simulating the natural stresses of wind they don’t encounter in the greenhouses. Also fascinating were her pheromone traps which confuse bugs so that they don’t reproduce. The plants are fed nutrients and water through an electronic irrigation system. After digesting all this information it was time to taste the produce. When it comes to my favourite things about living in Spain, tomatoes are in my top 5 and feature heavily in my cooking courses, and these did not disappoint. Simply dressed with a good quality extra virgin olive oil & salt, the selection of tomatoes from Lola’s ‘babies’ were some of the sweetest and most delicious I’ve ever tasted. On the tasting table amongst the varieties of tomatoes, I was surprised to see baby cucumbers drizzled with honey, these were really fabulous, a combination soon to be appearing in my kitchen in Vejer de la Frontera. Tasting tomatoes at Clisol. Tomatoes are one of my favourite things about living in Spain. Harvests take place between November and March. 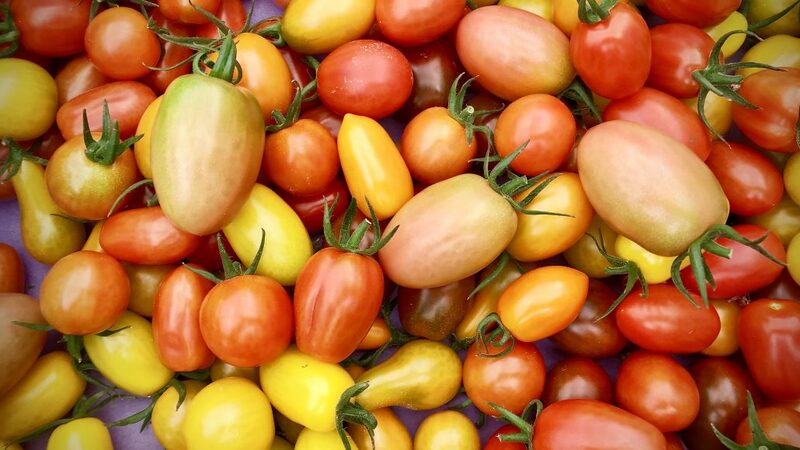 From the time of planting the turnaround time for cherry tomatoes is 75 days and 90 days for larger varieties. 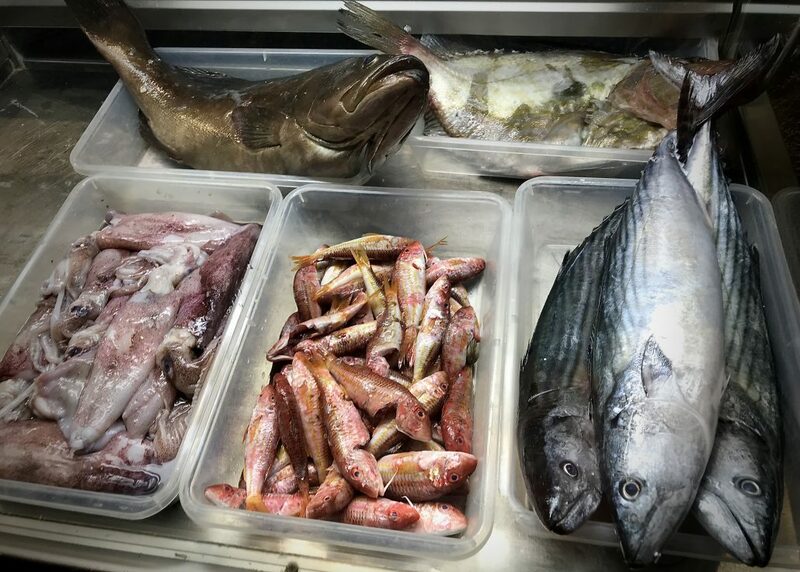 As guests with Tasty Andalucia, we were given special access to the trade-only fish auction at the Lonja de Almeria port, where restaurants, fishmongers and supermarkets come to purchase. We met Elvira, a marine biologist, who works for Del Barco de la Mesa (‘from the boat to the table’), this initiative sells products through its website from the auction direct to the consumer without the need for intermediaries, who would profit from the transaction. 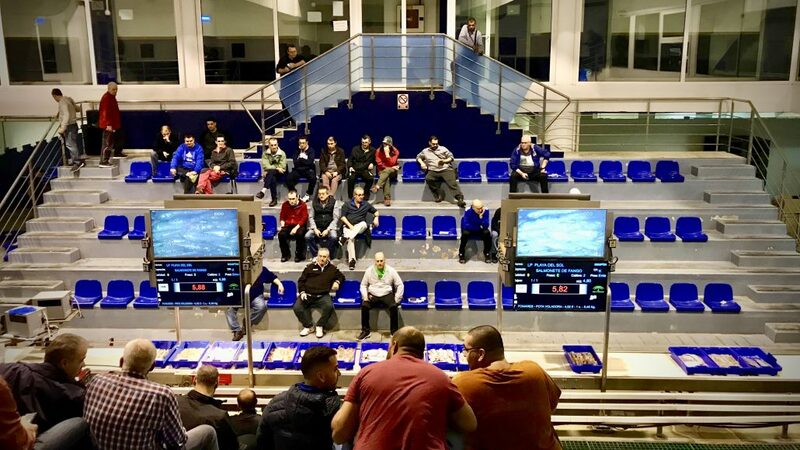 It was fascinating to watch the auction, seeing all manner of seafood and shellfish pass before us on the conveyor belt and go under the electronic hammer. Seafood wasn’t the only thing the fishermen were unloading from their boats, diligently they had collected bags of plastic that they find out at sea, it was great to see their efforts to rid our seas of plastic pollution. This is the fish that can be delivered to your door 2 hours after being bought at auction if you live 40 km away, or the following morning to anywhere else in Spain via Del Barco de la Mesa. If you don’t have a source of fresh fish close by, this is a great service. Evening – a fabulous dinner at El Parque with Del Barco de la Mesa. I highly recommend El Parque restaurant. 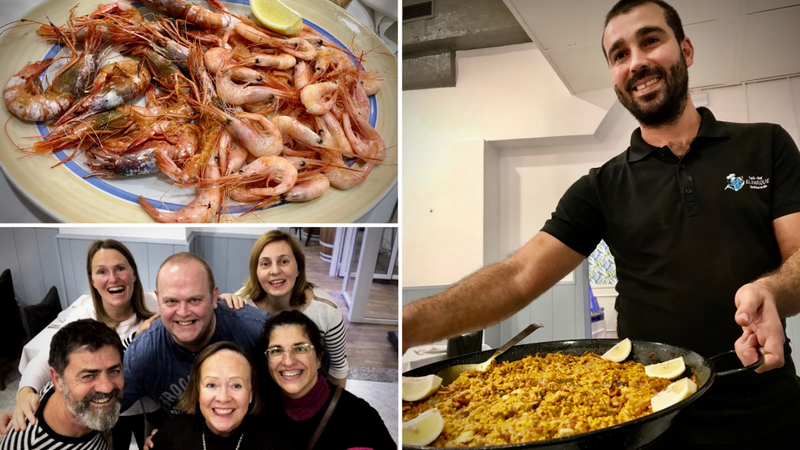 We feasted on gambas blancas (white prawns), gambas rojas (red prawns), quisquillas (a type of shrimp), monkfish cooked two ways; a la plancha (fried on a hot plate) and frito (deep fried), rice with ‘pota’ (a local squid) which was cooked in a way similar to a paella. All washed down with a perfectly chilled Manzanllia Sherry, which was the perfect combination. 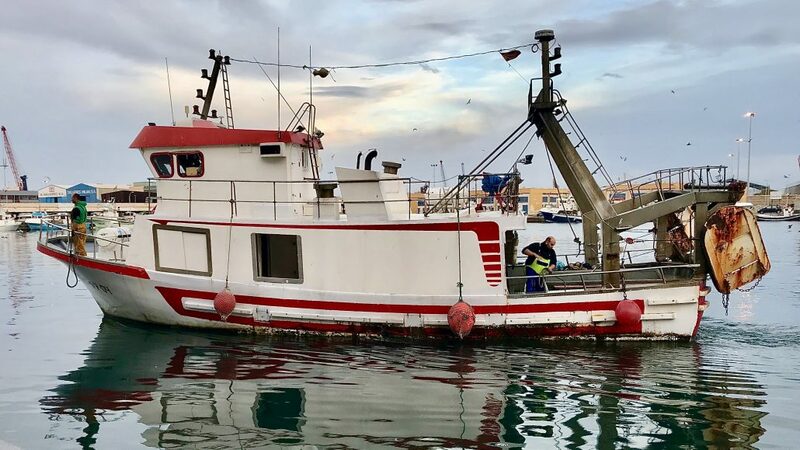 It was all absolutely delicious and exciting to eat what you have just seen being landed off a fishing boat, then into the auction and bought by Barco al Mesa.